The latest election results show that Eric Swenson has swept past Frank Lonergan in the Woodburn mayor race, defeating him by a margin of about 220 votes. The next update from Marion County Elections is scheduled for Nov. 14. Eric Swenson appears to have nearly caught up to Frank Lonergan overnight in the race for Woodburn mayor. Initial results showed Lonergan had a lead of 241 votes, but the most recent numbers show that lead has shrunk to a mere 18. 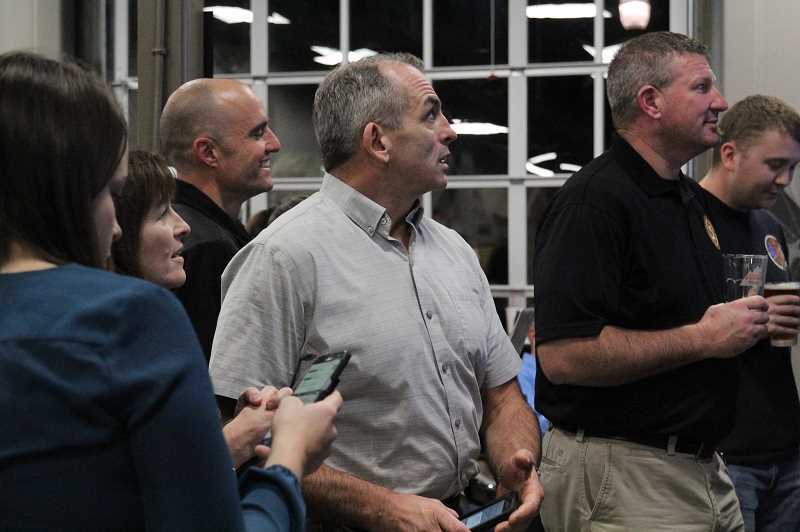 Initial results from Election Day ballots shows that Frank Lonergan will be Woodburn's next mayor and that the operating levy for Woodburn Fire District passed. Initial results on Tuesday night showed Lonergan defeating Eric Swenson by about 53 percent to 47 percent. "It's obviously not over, but I'm feeling comfortable and thinking at this point that I'm going to win," Lonergan said. "It was a good race. I became very good friends with Eric. I knew him vaguely from the budget committee and around town, but this election, we did a lot of things together and I think I can call Eric a friend now, which is something I couldn't before." Swenson and Lonergan appeared in a video together urging citizens to vote, setting an example to the dirty politics seen elsewhere during the election season. "That resonated with a lot of people," Swenson said. "That's what I'm most proud of is, that we showed how a campaign should run." "Eric and I talked at the very beginning, and we knew there wouldn't be anything negative, but we didn't realize we'd actually go over the line and enjoy doing things like that (filming a political ad) together," Lonergan added. "I give him a lot of credit for that. I think Eric probably is more popular in Woodburn than I am, since I've been working up in Wilsonville for the last 20-some years. And I'm hoping that this way I'm going to be able to work with him and grow this relationship. I think he still will be offering a lot to this city. Woodburn is going to come out ahead in this." 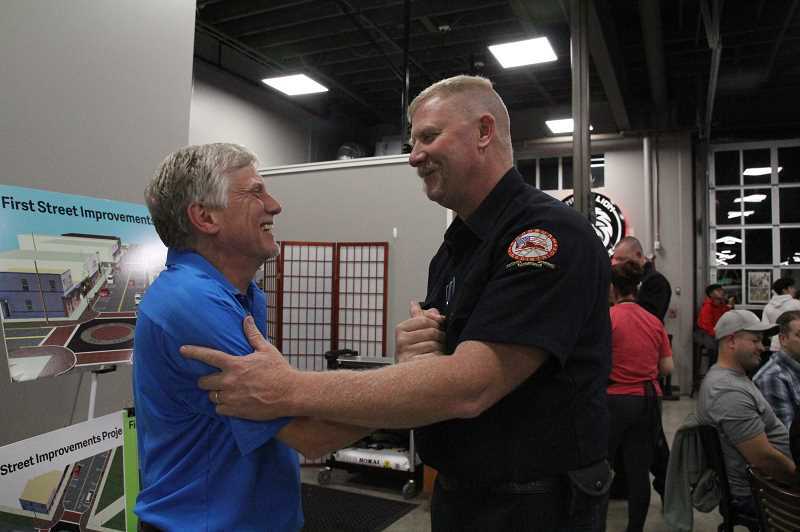 Measure 24-433, Woodburn Fire District's five-year local option levy, passed with roughly 53 percent of voters approving versus 44 percent voting against. "A consultant did an initial survey and the results showed it would fail if we didn't get a good message out," WFD Chief Joe Budge said. "So we got together and we were clear in what we plan to do with the money." National statistics show the difference behind life and death come with having a fourth person on a crew that dispatches to the scene of an emergency, but due to tightening its belt, Woodburn often only has three responders. Budge said that message really resonated with voters, as well as the fact that money would go toward making sure a paramedic is part of that four-person crew. "It's about service to the city," fire board Chairman Aaron Baker said. "We think voters saw what we are trying to provide and that's worth a cup of coffee a month. The new levy, which goes into effect in July 2019, will cost the average homeowner $5 a month, Budge said. 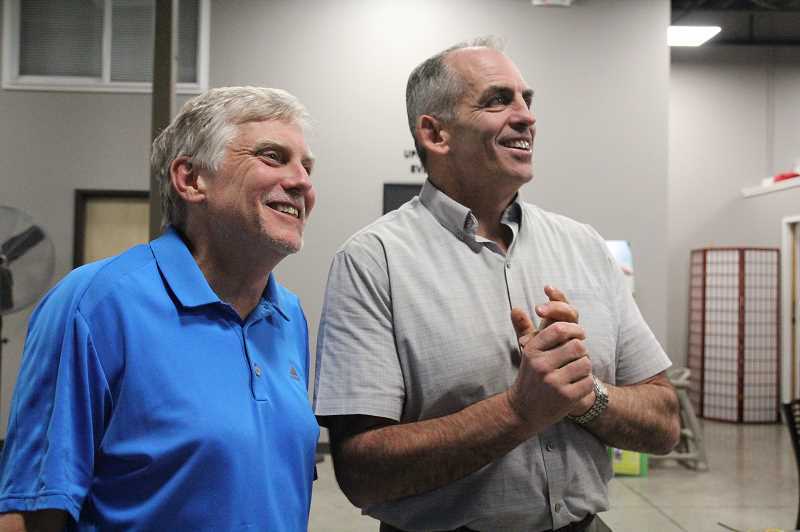 In the Marion County Commission race, Republicans Kevin Cameron and Colm Willis defeated Democrat challengers Shelaswau Crier and Bill Burgess, respectively. Hubbard's three-way race for two seats on city council ended with Robert Prinslow and Michelle Dodge garnering more votes than Jessica Countryman. In Gervais, incumbent city councilors Wes Leiva and John Harvey also retained their seats, unable to be moved by newcomer Robb Ladd. Aurora Mayor Bill Graupp was soundly defeated by Councilwoman Kris Taylor Sallee, who won by almost a two-to-one margin. Kara Weidman and Brian Asher defeated Tom Potter and Jerry P. King, respectively, in Aurora's city council race. The results from Donald are not so clear: Five votes separate the mayoral race candidates, incumbent Rick Olmstead (124 votes) and city councilor Brad Oxenford (119). And in St. Paul, longtime city councilor Rosemary Koch was defeated in a three-way race for two seats, which were taken by Velma Amaya-Medina and Peggy Sellers. The city of St. Paul also had a three-year local option tax for city operations on the ballot, and it was defeated 52.8 percent to 47.2 percent (a difference of seven votes). In the Oregon Legislature, local incumbents retained their seats, including Sens. Peter Courtney (D-D11) and Kim Thatcher (R-D13) and Reps. Teresa Alonso Leon (D-HD 22), Rick Lewis (R-HD18) and Bill Post (R-HD25). 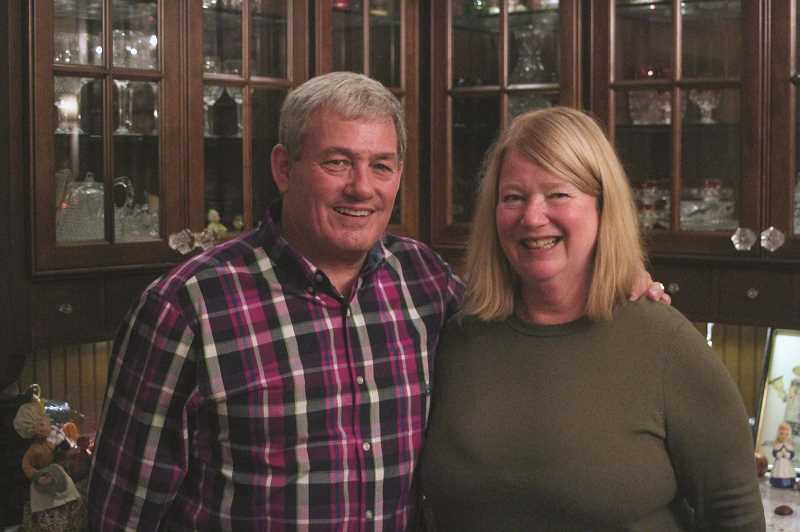 U.S. Rep. Kurt Schrader will continue to represent District 5 in the U.S. House of Representatives, defeating challenger Mark Callahan roughly 55 percent to 41 percent. The Oregon Secretary of State's office shortly after 8:20 p.m. showed that, after 1.3 million votes, Brown carried 50 percent of the votes, compared with Buehler's 44 percent. Brown's victory would cap a year-long campaign that set a new state record for campaign funding. Her and Buehler combined to spend more than $30 million, according to the Secretary of State's office. Statewide, Oregonians appeared to block attempts to overturn the state's sanctuary status for undocumented immigrants and affirmed public funding for reproductive health care. In so doing, Oregon voters rejected socially conservative priorities by large margins. They also appeared to roundly reject fiscally conservative measures that attempted to restrict tax increases, opening the door for broader tax reforms in the 2019 legislative session. In early statewide returns, 59 percent of voters rejected Measure 103, which would have banned taxes on groceries. And 67 percent of voters counted in early returns have rejected Measure 104, which would require a three-fifths majority vote in the Legislature on certain tax-related measures. Under Measure 104, lawmakers — 60 percent in both the House and Senate — would have had to vote "yes" to approve changes to tax credits, exemptions and deductions, or fee increases. Measure 105, which would have overturned a state law that prohibits local police from using their resources to apprehend people whose only violation of law is being in the country without legal permission, was rejected by 65 percent of voters as of 8 p.m. Supporters of the measure challenged a law that has been in place since 1987. It was designed to prevent racial profiling by police. The measure prompted a divide within the state's police community, with 16 sheriffs supporting the measure. Other police officials spoke out against it publicly, including Multnomah County Sheriff Mike Reese and Deschutes County District Attorney John Hummel. The measure demonstrated the renewed interest in immigration policy since now-President Donald Trump announced his candidacy in 2015. Voters also blocked Measure 106, which was mounted by a pro-life group that wanted to ban public funding for abortions, except those deemed medically necessary, required by the federal government, or to terminate a clinically diagnosed ectopic pregnancy. About 66 percent of voters rejected Measure 106. Amid a statewide housing crisis, Oregonians also approved a measure that allows local governments to use public bond money for private housing projects. And 56 percent of voters approved the measure in early returns. The measure requires local voters' approval of any such bonds, annual audits and public reporting on how the borrowed funds are spent. — Claire Withycombe and Phil Hawkins contributed to this story.